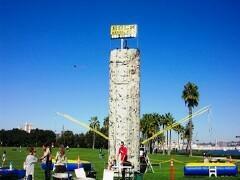 Our 25' Combo Wall with two Extreme Air Jumpers will be a total blast at your next special event! Over the years, you may have even seen this unit at the Mira Mar Air Show, LEGOLAND or THE SAN DIEGO ZOO and THE WILD ANIMAL PARK. Call us now as we are quickly booking our Extreme Airs and Combo walls for the Spring, Summer and Fall seasons. This wall accomodates users from 40 pounds to 200 pounds. The Combo Wall is a 25' rock climbing wall with 4 climbing routes and 2 extreme air trampolines connected to it. Six people can participate on the attraction at the same time. This unit requires a dedicated 20 amp circuit within' 50' and will require a larger operating footprint, call for details. We will require a trailer accessible event site with level ground and no overhead obstructions please. We will need room for the truck to tow / maneuver the Combo Rock Wall trailer into position. Please call us with any questions regarding event site accessibility limitations. We include 2-3 staff members with the Combo Wall rental and request a couple volunteers to assist at the busier large events. Can't provide volunteers... no problem, we can provide additional staffing for $20 per hour. No electricity at the event site... no problem, we can provide generator rentals for an additional fee.